The ever delightful Caroline Smailes (even lovelier in real life, if that is possible!) came up with an idea at the start of the year of putting together a collection of flash fiction stories, all inspired by songs on YouTube. The collection was to be published as an eBook on Amazon, and ALL the money collected would go to the charity One in Four, which provides support and resources to people who have experienced sexual abuse and sexual violence. So the call went out, and many, many (350) people answered the call. Many, many hours later, Caroline has done the impossible and drawn together a collection of 100 amazing stories (all of 100 words or less), got Nik Kershaw (yes, you heard me, Nik Kershaw! – there might have been Squeeing in MeadowTerrace) to write an introduction, and persuaded Becky Adams and Ifan Bates to design the cover. Phew. The woman has worked miracles. Et voila! 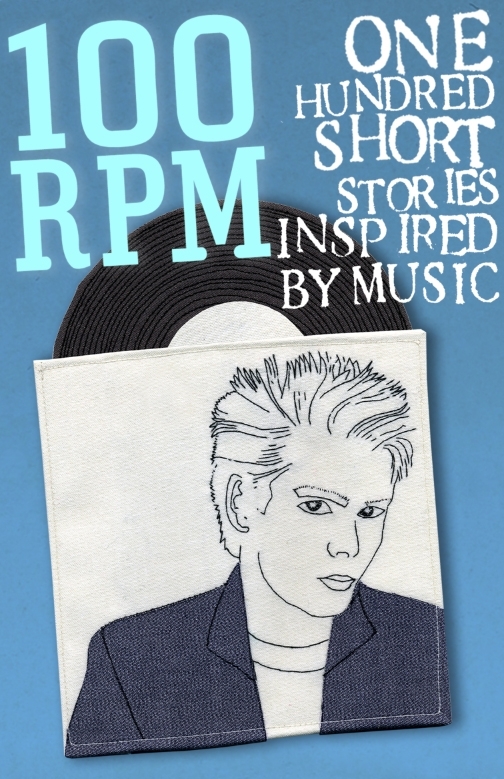 The fantastically awesome collection, called 100RPM, is published today, and is just a click away . (Via Amazon and their DRM, I know, I know, but it’s for charity. Live with it). If you have a Kindle, why not buy it? Even if you don’t have a Kindle, but have an iPhone or other fancy smartphone, there’s a Kindle app out there for you. If you don’t have either, er… Buy it anyway? It’s only 99p this week. More information on Caroline’s blog. What are you waiting for – go buy it! Why? I hear you ask. Oh, all of that isn’t enough for you? Well 😛 And I suppose I can reveal that I wrote one of the stories. No, I’m not telling you which one because it’s under my super-secret pseudonym, but if you know anything about me, you’ll work it out. So, you’re going to buy it now, aren’t you? There’s also a playlist on YouTube, so you can listen along as you read. Frankly, at 100 words the stories will be over long before the songs that inspired them, but it’s all good music. A lovely eclectic mix. Rather like the collection of stories themselves now I think of it. I bought this book because an author whose novels I love compiled it and it’s raising money for a great charity. If I’m completely honest I wasn’t sure how much I would enjoy it as I’m not really a huge fan of short stories but this book may just have converted me because it is simply fabulous. The stories are all brilliant and even though they are all under one hundred words they have such power. I actually cried over two of them and nodded my head in recognition of the emotion in others. I love how the stories are all inspired by songs and I now have many of these songs swirling around my head. Some of these stories will stay with me for a very long time, they’ve really got under my skin in a way that a short stories never have for me before. This book is one I will definitely read more than once and I’ll be recommending it to everyone I know. Go buy it; you won’t regret it! And if you’re not going to buy it after all of THAT just look at this post. I have never, in my entire life, been concise. EVER. And I managed to write a 100 word story that was good enough for a proper, published author to pick. Surely THAT is enough reason for you to part with less money than you would need to buy a coffee in Starbucks. So BUY IT. If you don’t buy it, I’ll dedicate a month of my 365 project to alternating pictures of my feet and the cat, because you all love those, don’t you. Trust me, it’s easier just to buy it.